3D Sci Fi Movie Maker features a unique 3D Engine that utilizes the power of your PC’s graphics hardware in order to create stunning sci-fi videos in real time. As long as your PC’s graphics chip supports OpenGL then it will work great with 3D Sci-Fi Movie Maker. If you’re not sure then there’s an easy way to find out. Download our free demo today! Buy it risk-free. We offer a no quibble 30 Day Money Back Guarantee! We think that 3D Sci-Fi Movie Maker should speak for itself. Please take a look at just some of the movies made with 3D Sci-Fi Movie Maker currently seen by hundreds of thousands of youtube sci fi fans! 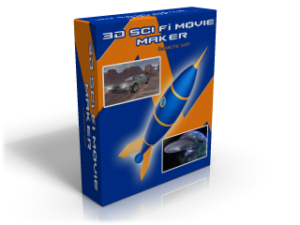 If that’s not enough to convince you that you need to purchase 3D Sci-Fi Movie Maker then why not try our free demo? This includes enough 3D Models and textures to give you a good idea of what the program is capable of. The only restriction is that you can’t export video from the demo. Here is a small collection of promotional and tutorial videos for 3D Sci-Fi Movie Maker that gives a good overview of the product in action, as well as how to use some of its features.